Today is MOVING day! Lots of time spent packing and packing and packing. Then, came the actual moving, and I am SO thankful for the group of guys that came out to help with the heavy (and not so heavy) stuff! 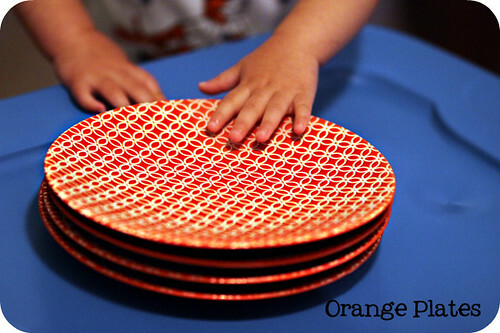 One of things we had to pack away were my set of favorite orange salad plates from Pier One. Josefine gladly helped with the packing. Everything I put in a tote, she took out of it. Today I was made aware how great a tool the Pack 'N Play really is. And then, when that stopped working (about 10 minutes later), I was even more blessed by my neighbor who was willing to entertain Josefine for a few hours. The poor girl was getting quite bored and a bit overwhelmed with the increasing number of totes to empty! Good-bye brightly colored, mod-looking orange plates! Hello paper plates (and HELLO to less dishes to wash for the next few days as well)!